Elizabeth Louise Kreher Witt, or as it appears on the above, Mrs. Elizabeth Witt, is my 3rd great grandmother. She was born on 22 March 1840 in Herman Township, Butler, Pennsylvania and died at the age of 89 (or specifically, 89 years, 9 months and 15 days) on 13 January 1930 in Pittsburgh, Pennsylvania. Her husband Martin preceded her in death by nine years. From this death certificate, we know that her father was Chris Kreher and her mother was Anna Hause, both born in Germany. She died from arteriosclerosis, having been under a doctor’s care for the last few days of her life. Her son Martin Witt served as the informant of her death and McCabe Brothers Funeral Home handled the arrangements. (They remain a Pittsburgh-area funeral home however their location at 3520 Butler Street is no more.) Elizabeth was buried on 15 January 1930 at Mount Carmel Cemetery in the Penn Hills neighborhood of Pittsburgh. 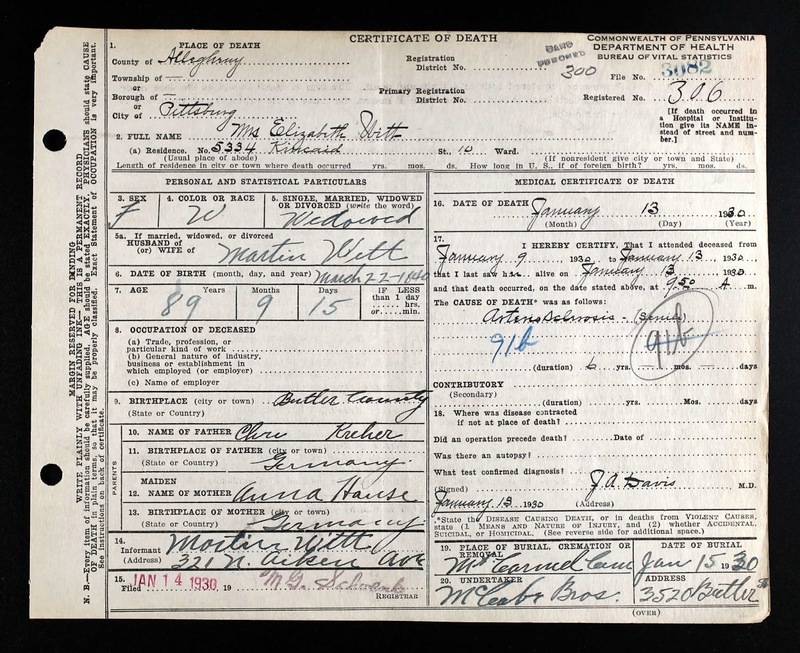 “Pennsylvania Death Certificates, 1906 – 1963,” index and images, Ancestry.com, accessed 18 Jan 2015, Elizabeth Witt, 1930; citing reference Pennsylvania (State). Death certificates, 1906–1963. Series 11.90 (1,905 cartons). Records of the Pennsylvania Department of Health, Record Group 11. Pennsylvania Historical and Museum Commission, Harrisburg, Pennsylvania. http://www.phmc.state.pa.us/.